I recently had the opportunity to try several of the Wellness canned cat food varieties for my cats. In the interest of full disclosure, the food was provided to me by the company that distributes for the specific purpose of reviewing the product. I was actually very impressed with this food. I was sent several of the grain-free varieties and I love the fact that they all have high-quality protein sources. I also like the fact that the foods are free of any artificial coloring or artificial preservatives. The first ingredient in all of these foods is a protein source. There are chicken, beef, tuna, salmon and turkey varieties available. There are also several different textures available. My cats seemed to like the minced and the cubed varieties the best but they readily ate all of the varieties supplied. My cats are not typically picky eaters but they really did seem to enjoy these foods. To me, that is an important point. 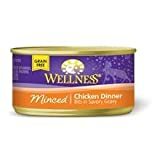 I believe the quality of this food to be high but no matter how good the quality of a particular food is, it does my cats no good if they will not eat it. With these foods, getting them to eat the food was not an issue at all, though they did favor some of the flavors over others. 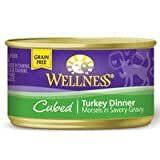 Though I do not and never did feed the Wellness canned food exclusively, I have continued feeding it intermittently to my cats. They continue to like the food and always finish the serving in a relatively short period of time. And they do seem to be thriving. 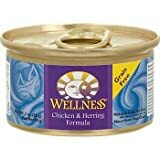 Who Would Benefit from Wellness Canned Cat Food? 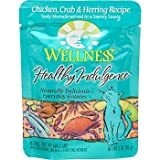 I would not hesitate to recommend Wellness brand canned cat food to any cat owner who is looking for a high quality canned alternative for their cat. Based on the ingredients and the positive experience my cats have had with the food, I believe it to a good alternative particularly for those people looking for a more natural and/or grain-free cat food. Water is one of the most important nutrients with respect to a cat’s overall wellbeing. Since cats do not have a strong thirst drive, it is important for a cat to ingest water with its food. Packed with the same whole food nutrition as our dry formulas, Wellness canned foods area delicious way to increase your cat’s water intake. As a special treat or as a part of your regular feeding, Wellness canned foods are yet another tasty way for your cat to eat healthy. These tasty Morsels in Rich Gravy include natural, wholesome ingredients with no added artificial colors, flavors or preservatives. 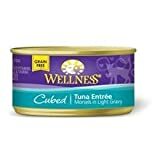 This entree is a great way to add some variety to your cat’s diet, in addition to providing an additional source of water for healthy hydration! 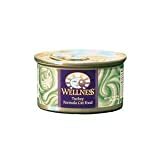 Find more Wellness Canned Cat Food products on Amazon!